MikroTik is moving up in the world. At MUM Europe the company announced a new fleet of switches as it takes on the higher-end market segments. Traditional network switch vendors are focused on the 25GbE/ 50GbE/ 100GbE transition. As a result, the 10GbE/ 40GbE segment is becoming commoditized. 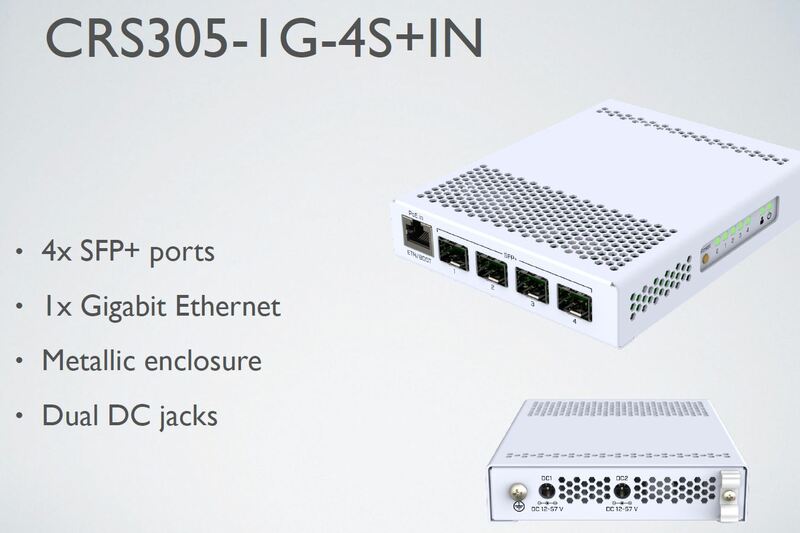 MikroTik is seizing this opportunity to drastically expand its high-end 10GbE and 40GbE switch lineup. We have an overview on the new models which count seven total. This is a major expansion of the MikroTik switch range. The first switches we wanted to touch on are the CRS354 series. 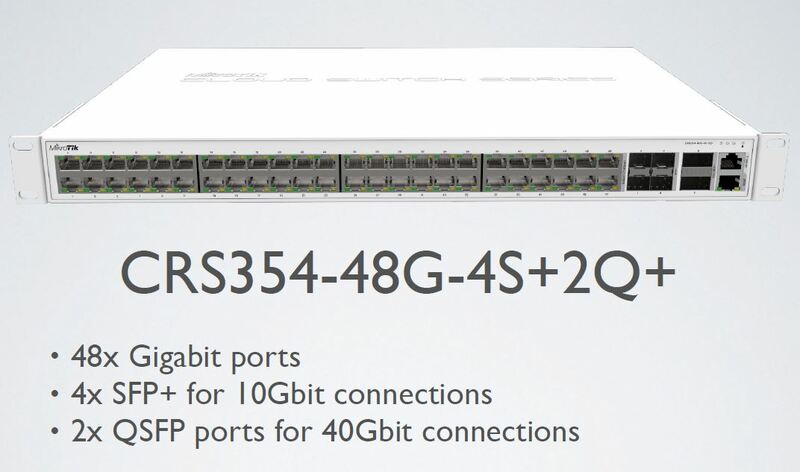 These switches have 48x 1GbE ports but also 4x SFP+ and 2x QSFP+ ports. The SFP+ ports are for 10GbE and the QSFP+ ports are for 40GbE. 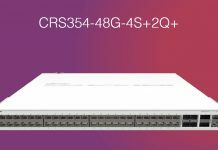 On the MikroTik CRS354-48G-4S+2Q+, the 48x 1GbE ports are standard ports. 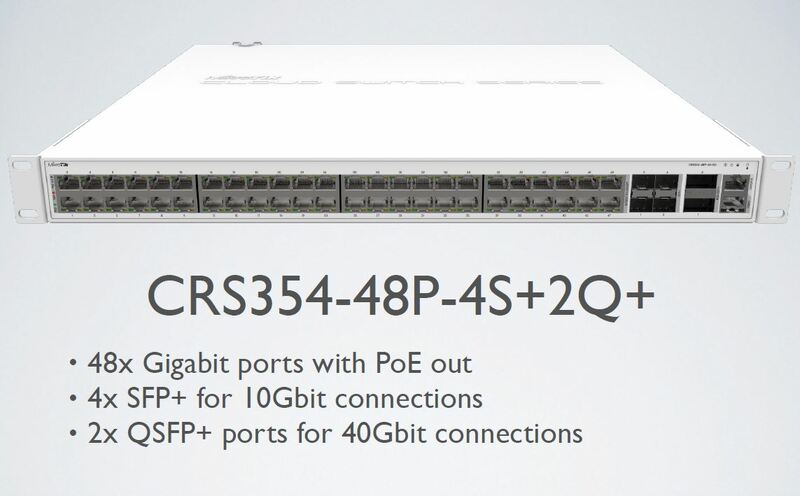 There is another variant, the MikroTik CRS354-48P-4S+2Q+ which has PoE on the 48x 1GbE ports. 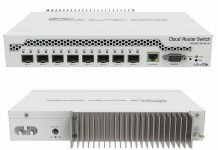 If you are looking to power access points or 1080p / 4K video cameras, this is an intriguing rackmount solution that has significant upstream ports for storage or LAN/ WAN access. This is certainly moving up the stack for MikroTik which is welcome. We loved the MikroTik CRS226-24G-2S+RM but this is a major step up on all counts. At the other end of the spectrum is something truly unique. The company has a 4x SFP+ plus 1x 1GbE port model. The MikroTik CRS305-1G-4S+IN also features a metallic case for edge deployments. This is really intriguing to see as it is a product designed for 10GbE at the edge. Most of the 4x SFP+ switches we have seen to date have 24-48x 1GbE ports as well. This is a 10GbE focused switch. 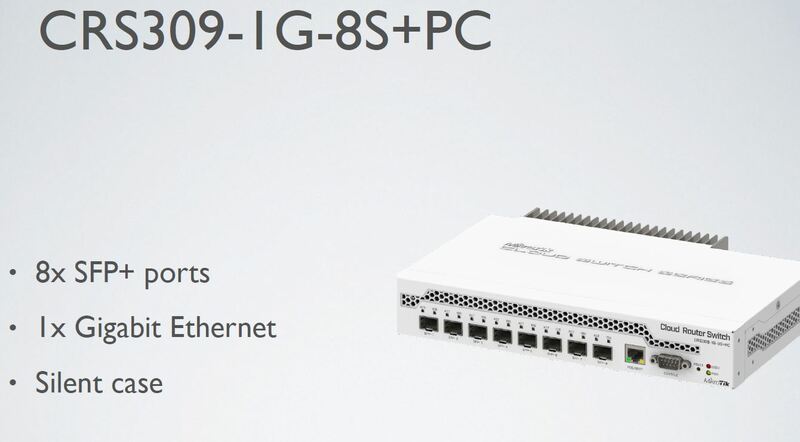 For those who have noise constraints, there is a new passive cooling 10GbE switch on the market. The MikroTik MikroTik CRS309-1G-8S+PC has 8x SFP+ ports and a single 1GbE port. Typically, MikroTik is extremely aggressive with pricing in this segment which could make this a great option. 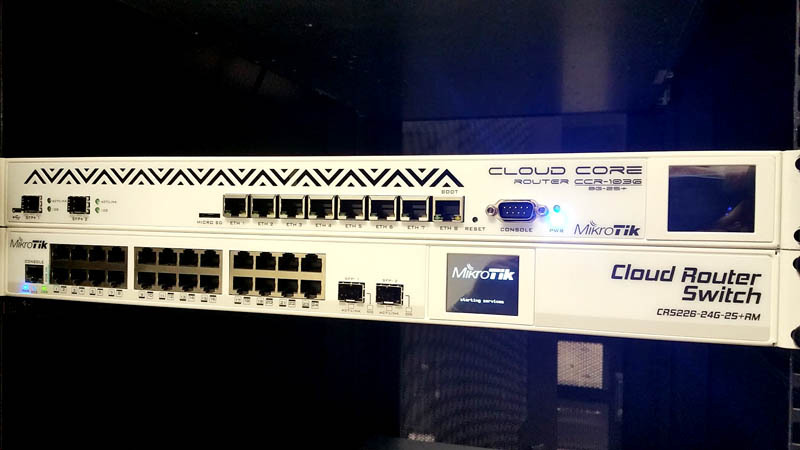 Beyond these options, MikroTik also has three new rackmount switches that are going to be unique as they hit the market. We are going to cover those three next. When are these switches going to be released? > But if you look into performance sheet, they supply only up to 1GigE throughput numbers. Why? Isn’t it possible to switch 10GigE wirespeed? Not true: it is switching at 10G, but routing at 1G speeds. By the way, if you like the SG350 series, look at the SG350X. Can be had at good prices when you search for it. It is a better featured switch than the mikrotik (very nice when stacked, I use it that way), but still not in the league of the bigger boys (small buffer, language crippled, and the DHCP server is simply unusable). A LOT noisier than the CRS317 I have though (which is completely silent after boot), even with retrofit low noise fans. My take at it: 10G L2/L2+ switching is affordable now, especially with this new mikrotik range. L3 on 10G is still costly. You are right that L2 switching numbers are way higher than L3 bridging/routing numbers. On the other hand if you count with required switching capacity for provided ports, then you have 24 x 2Gbits + 2x 20Gbits. I’m counting with full-duplex hence twice the port speed. This leads to 24 * 2 + 2 * 20 = 88 Gbps switching capacity. If you look into perf. numbers, you see that only “Switching …. capacity” provides this, but “Switching …. throughput” is kind of limited to ~45 Gbps. Why is that? Hmm, anyway, I’m very grateful for your comment, I’ll still need to consider CRS326 so it’s back in game. CRS326 like most switches has full non-blocking switching performance. Capacity double counts ingress and egress traffic; throughput single counts traffic passing through the switch. L1 throughput is always half of L1 capacity. L2 performance is derated based on framing overhead, exactly as expected. If you are OK with a web GUI and don’t need routing features, you may also want to consider CSS326, which is lower cost and lower power than CRS326 and still a very capable switch. Both are passively cooled (no fans). Word has it, MicroTik says it’ll be ready in March 2019. But I won’t hold my breath.